The Caustic Dweevil (ルリショイグモ?, lit. 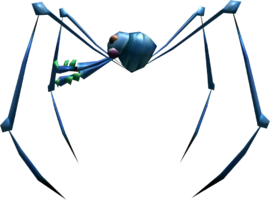 : "Lapis Lazuli Carrying Spider") is a member of the Dweevil family, a non-aggressive enemy found in Pikmin 2 that attacks in self-defense. As is typical of Dweevils, it picks up any treasure or enemy body it can find, only releasing it when Pikmin attack. The only offensive measure the beast can take is spraying an acidic bodily fluid that functions identically to water, meaning it chokes and drowns all Pikmin types except blue ones and Bulbmin, making those the best choice in battle against it. Caustic Dweevils scurry about randomly and take no note of the presence of any leader or Pikmin if left undisturbed. When provoked one will attempt to defend itself by releasing a pressurized spurt of water below it. Caustic Dweevils are frail creatures and will die quickly if attacked by even a few Pikmin, or by the punches from a leader. When a treasure or a corpse of another creature is nearby, a Caustic Dweevil will lift it up onto its head and carry it, making it impossible for Pikmin to collect until it is broken free. When a Dweevil has an item in its possession, it will stay at rest, crouching down, appearing as if it is only the item, until it is approached by a leader or Pikmin, at which point it will stand up and run away. Throw Pikmin onto a Caustic Dweevil's small head. Although they can harm non-Blue Pikmin, they are weak and often die before getting a chance to attack at all, and this does not kill Pikmin instantly, allowing them to be whistled to safety by a leader if they do come into contact with the attack. Be aware, however, that depletion of a Dweevil's HP will not stop an oncoming attack, so if one starts its attack animation, be prepared to whistle your Pikmin back. Purple Pikmin are particularly useful in defeating large numbers of smaller Dweevils with ease, since they stun when thrown, halting any enemy attacks, usually until death. Alternatively, you can use leaders to defeat the creature in an ultimately safer way. Run up to it and punch it until it begins its attacking animation, leaving plenty of time to run away before it attacks. Run back and continue the assault when the acid stops. Something that is caustic can corrode living tissue, like acid. The Caustic Dweevil attacks with a water-like acidic liquid, as pointed out by Olimar's notes. In Japan, this creature is called ルリショイグモ? which means "Lapis Lazuli Carrying Spider"; lapis lazuli is a blue stone. Their scientific name, Mandarachnia sulfurnid, uses the word sulfurnid, referring to sulfuric acid. Internally, it is called waterotakara, a combination of "water" and "otakara" ("treasure"). Caustic Dweevils were initially called Acidic Dweevils, according to the early English script left unused inside Pikmin 2's files. Artwork of the Caustic Dweevil. A Caustic Dweevil releasing its bodily fluids from beneath it. A close screenshot of a Caustic Dweevil. The Caustic Dweevil was planned to be included on the 2-Player Battle Roulette Wheel as an enemy, but was eventually removed. It's paired up with the Fiery Dweevil, and it shares its removal with the Spotty Bulbear and the Antenna Beetle. This article was a featured article from January 26th to May 6th, 2009. This page was last edited on December 23, 2018, at 00:12.